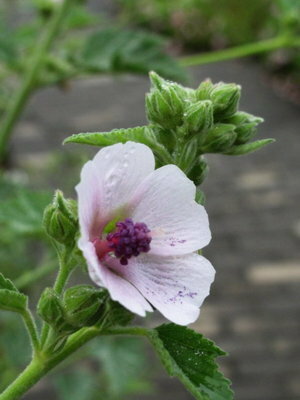 Althaea officinalis is also known as marchmallow root. It is an upright perennial with a fleshy taproot, downy stems and velvety leaves, with pale pink flowers in summer. The roots are mainly used, but the leaves and flowers can also be used. It contains mucilages (polysaccharides), which are mostly composed of galacturonic acid, glucuronic acid, galactose, arabinose and rhamnose.